Pumpkin ranks high on the glycemic index, or GI, which suggests that the carbohydrates in this nutrient-rich vegetable could cause a marked increase in your blood sugar. However, if you're using the GI values of foods to manage your blood glucose levels or control your weight, you shouldn't avoid this nutrient-rich member of the squash family. According to the Glycemic Index Foundation, the low carbohydrate content in pumpkin offsets its high GI value, resulting in a lower effect on blood sugar than its GI ranking might indicate. The GI value of pumpkin boiled in salt water is 75, which makes it appear to be a high-GI food. The glycemic index evaluates the effects of foods that contain carbohydrates on blood sugar levels. The higher a food ranks on a scale of one to 100, the faster its carbohydrates are converted to glucose during digestion. High-GI foods break down quickly after you've eaten them, and may raise your blood sugar significantly. 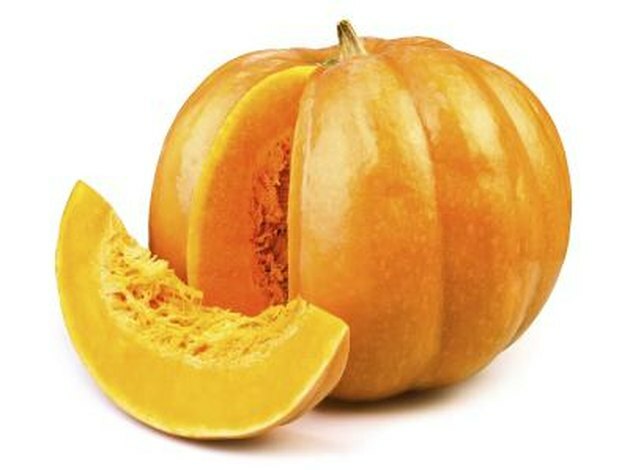 Pumpkin offers an example of the way the carbohydrate content of a food may reduce its metabolic effect. The glycemic load takes into account both the GI value and the amount of carbohydrates that a food contains. Although the carbohydrates in boiled pumpkin may have a marked effect on your blood sugar, about four-fifths of a cup of pumpkin contains only 4 g of carbohydrates--and has a glycemic load of 3. A total of 4 g of carbohydrates represents 5 percent of the total content of a serving of pumpkin, which means you would have to consume a large amount of boiled pumpkin to increase your blood sugar significantly. The deep orange hue of pumpkin indicates that this vegetable is high in beta-carotene, a plant-based pigment that converts into vitamin A. Beta-carotene is an antioxidant nutrient that may prevent the cellular damage associated with cancer, heart disease and premature aging. One cup of pumpkin provides 2,650 IU, or international units, of vitamin A, 12 mg of vitamin C, 3 mg of vitamin E, 564 mg of potassium, 37 mg of calcium, 1 mg of niacin and 21 mcg of folate, according to the University of Illinois. One cup of boiled pumpkin has 49 calories, 230 g of water and 3 g of fiber, which means that it provides volume and numerous essential micronutrients without a large number of calories. Foods with a low energy density, such as pumpkin, can help you lose weight by curbing your hunger with their fiber and water content. The low glycemic load of pumpkin, combined with its low calorie content, makes pumpkin a good choice for maintaining a stable blood sugar level and controlling your weight. Harvested in autumn, pumpkin is a seasonal vegetable, but you can benefit from the nutritional benefits of canned pumpkin year-round. Canned pumpkin is higher in vitamin A and iron than boiled pumpkin, according to data from the University of Illinois. However, canned pumpkin is also higher in carbohydrates, which means that it may cause a significant increase in your blood sugar.